are suitable for neutral, aggressive and hardly combustible liquids. They are used specifically for pumping aggressive chemicals such as acids, alkalies or detergents. Media: Formic acid (50%), ammonia, boric acid, distilled water, liquid fertilizers, iron-II and III-chloride, acetic acid (80%), photo developers, fruit acids, potassium hydroxide, copper chloride, lactic acid, sodium hydroxide, phosphoric acid, hydrochloric acid, sulfuric acid (up to 90%), hydrogen peroxide, citric acid and many other media. are especially suitable for highly aggressive liquids such as concentrated acids and bases. Media: Hydrobromic acid, perchloric acid, chromic acid, hydrofluoric acid, sodium hypochlorite, nitric acid and sulfuric acid (> 90%). 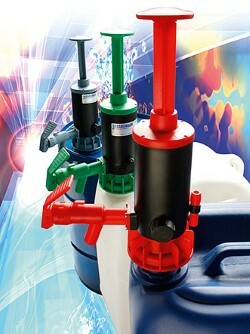 Also all media that are listed at the pump tubes made of polypropylene can be handled. 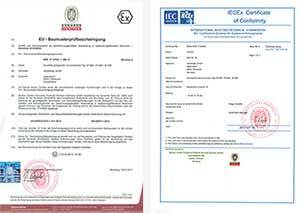 are suitable for neutral and hardly combustible liquids. With these pump tubes particularly mineral oil products up to a maximum viscosity of 1.000 mPas will be transferred. Media: Drilling emulsions, diesel, liquid soap, liquid wax, gear oils, heating oil, hydraulic oils, machine oils, mineral oils and motor oils. are used for all neutral, slightly aggressive liquids such as diluted acids, alkalies or detergents and thin fluid food. In addition the pump tubes provide a special safety for conveying or transferring flammable liquids of different hazard classes (up to temperature class 4) in the Ex-zone 0 and when pumping low-viscous neutral or slightly aggressive media in Ex-zones 1 and 2. Media: Acetone, alcohol, ammonia, gasoline, flammable solvents, caustic lye, nitrocellulose lacquers, perchlorethylene, phosphoric acid, sulfuric acid (up to 7.5% and over 90%), trichlorethylene, toluene. In addition the stainless steel pump tubes are suitable for pumping thin fluid food such as fruit juices, milk, edible oils and for all media that are mentioned at aluminium tubes. We will be pleased to advice you regarding chemical resistance. Please ask us. Pump tubes with rotor are used when high capacities and low heads are required. A typical application is the decanting of drums and containers at same level. A rotor made of stainless steel 316Ti is available as an option for stainless steel pump tubes. If larger heads at lower flow rates are required pump tubes with radial impellers are the right choice. For this a special pump foot is required. In any case it was to be considered that the actual performance of a pump tube is depending on the power of the used motor. An impeller made of stainless steel 316Ti is available as an option for stainless steel pump tube.